I'm solving simple 3D sphere collisions by checking the sphere for overlap with a mesh, finding the nearest point on that mesh's surface to the center of the sphere, and then resolving the collision by moving the sphere out of the mesh using the normal and the penetration distance. To find the normal, I'm using the normalized vector from the nearest point on the mesh to the center of the sphere. Now I'm trying to resolve a collision where the sphere has overlapped more than one collider. How I'm currently solving it is by iterating through all the meshes and checking to see if the last correction solved the collision. In the scenario shown in the bottom image, this can cause a problem when trying to determine a collision normal. 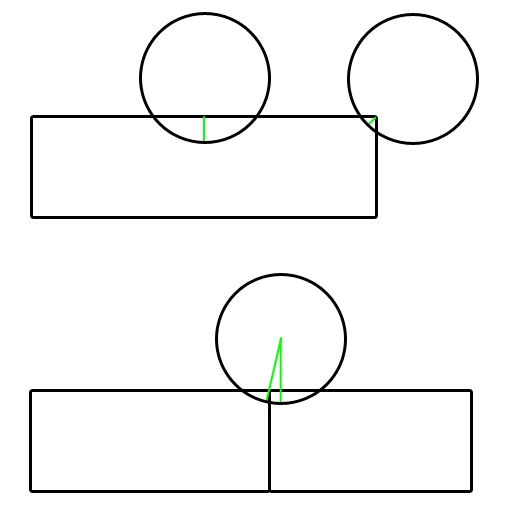 The two collisions return two different normals, as they should (Though, Depending on which collision was resolved first, the correction from the right box would solve the collision with the left box, in which case there would only be one normal). Now, mathematically, that all makes sense, but visually causes a problem. If I'm trying to determine a single normal to, say, bounce the ball off the surface create by those two meshes, any normal that takes both collision normals into effect would be inaccurate. Visually, one would expect the collision normal to be straight op, but since one of the collision normals is at an angle, I would need to somehow determine that that is a sort of "false" normal. The solution that comes to mind is to order the collision checks by their distance from the sphere, thereby ensuring that, in that scenario, the angled normal never even comes into play. Is this an accurate way to do this, or would that cause other problems I'm not seeing? Browse other questions tagged 3d-meshes collision-resolution normals sphere collider or ask your own question. Is it possible to get the colliding sides using the separating axis theorem? How can I determine “exact moment” of collision with ray casting? How do you compute the tangent space vectors with normals given in the mesh?